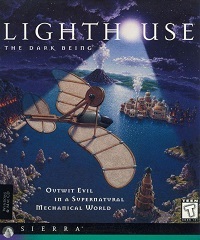 You can run Lighthouse under DOSBox without a problem. If you are unfamiliar with DOSBox, you can use this automatic installer from the SierraHelp pages. You can also install the game, using Jafa's XP/Vista installer for Lighthouse. This installer scales to use the entire screen (Direct3D bilinear interpolation), eliminates black lines in cut-scenes, applies per-user save games (Vista friendly), fixes exceptions and script errors under XP/Vista and fixes interactive animation speed on modern CPUs.